Our forecasts are showing, in line with the opinion polls, that there is a swing from the SNP to the Conservatives of over 10% in Scotland – our latest forecast had it at 11.4%. Most of this is due to an upsurge in support for the Tories rather than a fall in SNP support, though that is a factor as well. The obvious question arises as to exactly what it would take for the Conservatives to make significant gains at the SNP’s expense. Our forecast has moved the centre point of our expectation of Tory seats in Scotland from anywhere around 6 to 11 or more. These changes represent the differences between swings of 7.5% and 12.5% and the chart to the left shows how as the swing across Scotland increases, the number of SNP seats that would fall to the Conservatives also increases. 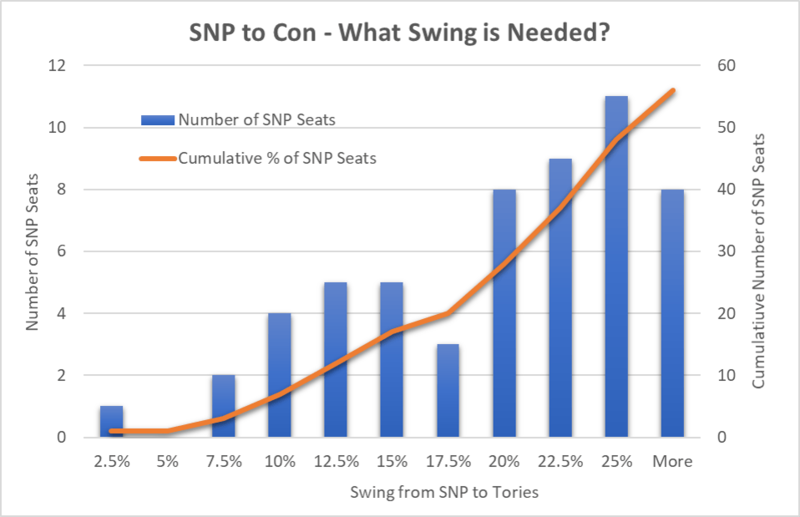 A swing of 10% would bring in about 7 or 8 seats into the Conservative camp from the SNP. As we move into swings in the region of 12.5% or 15%, we see that there are 5 seats available for each move along the lower axis. This explains the volatility of our NowCast – just 1% down for the SNP and 1% up for the Tories and 4 or 5 seats can fall. All this means that once the swing is 10% or more the seats start falling. The rate at which the seats fall slows down in the 15% to 20% swing range, and that means that whilst our latest NowCast might show 12 seats for the Conservatives, it would need a really large shift for significant number of seats to change. Once we reach a swing of 20% (so for example, the SNP dropping by 5% and the Tories up by 15%), then the SNP seats really begin to switch hands. So is such a swing likely? 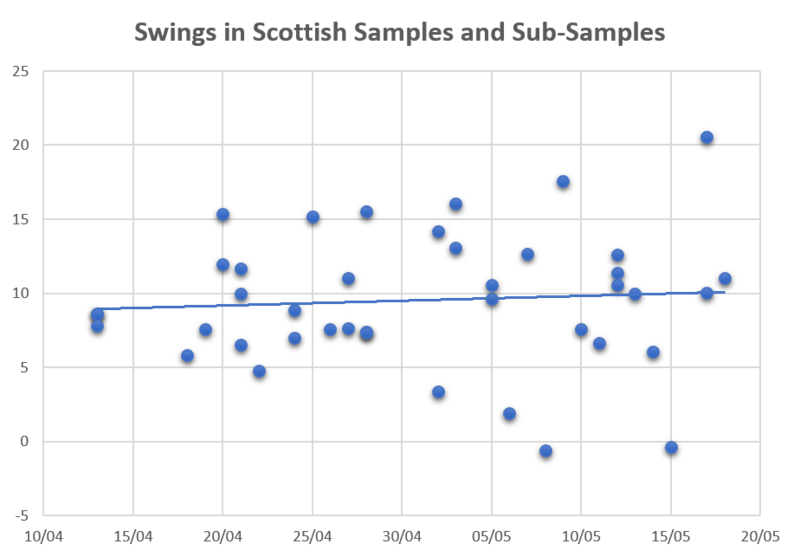 On this second chart we show the swings indicated in all Scottish samples and sub-samples since the election was declared. Whilst small sub-samples from a national poll should never be used by themselves to indicate the levels of support for parties, standardised and aggregated they can become powerful analytical tools. They tell us that in the past two months we have only seen two samples or sub-samples indicating swings of 17.5% or more. These are the levels of swing at which SNP seats would really start to fall. In fact, the average swing indicated has been around 10% which would see around seven or eight seats won by the Conservatives from the SNP. A 20% swing would see almost four times as many seats switch hands, but we are not in that kind of territory yet. Our analysis indicates that even a small change in SNP or Tory support at the moment could move the fate of a few seats in Scotland and the Conservatives might gain up to 10 seats next month, or even more.. We are however, not at the point yet where the Tories will make major inroads into the SNP Westminster tally. That would require the swing almost doubling from what it is at the moment and there is little evidence of that happening in the next three weeks.